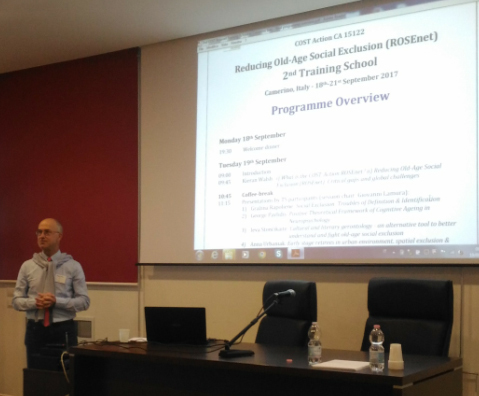 Organised by INRCA, Italy’s National Institute of Health and Science on Ageing, in collaboration with the University of Camerino (Italy) this training school considered critical and emerging global exclusion issues in relation to: ageing and migration; the role of intergenerational relationships in exclusion analysis, including the role played by welfare regimes and policies in this respect; older people in the case of disasters; and elder abuse as a pathway to loneliness. Hosted by the University of Camerino (Italy) on the 18 to the 21st of September, the school featured key experts in these areas and provided the opportunity to discuss participant projects and interests. The full programme can be downloaded here.